Today is the day. 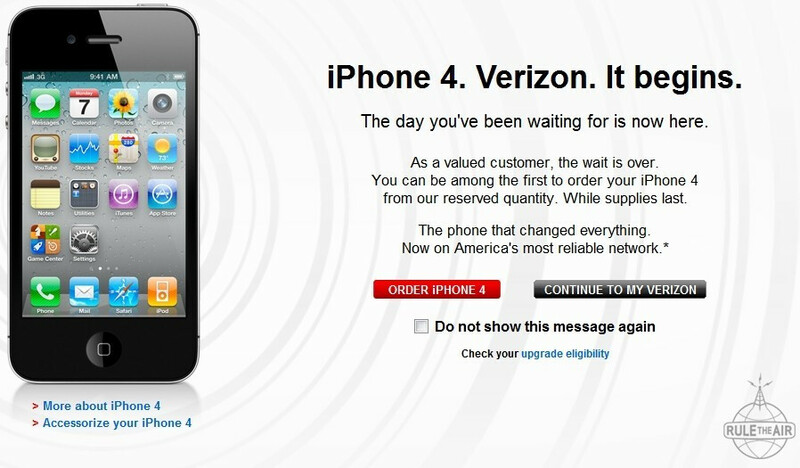 If you happen to be one of the 94 million Verizon Wireless customers, you can now log into your on-line account and pre-order the Apple iPhone 4. You can purchase the 16GB model for $199 with a 2-year contract, or the 32GB model for $299. Also, if you have a New Every Two credit, that can take between $30 and $100 off of the price, making the 16GB model as low at $99. 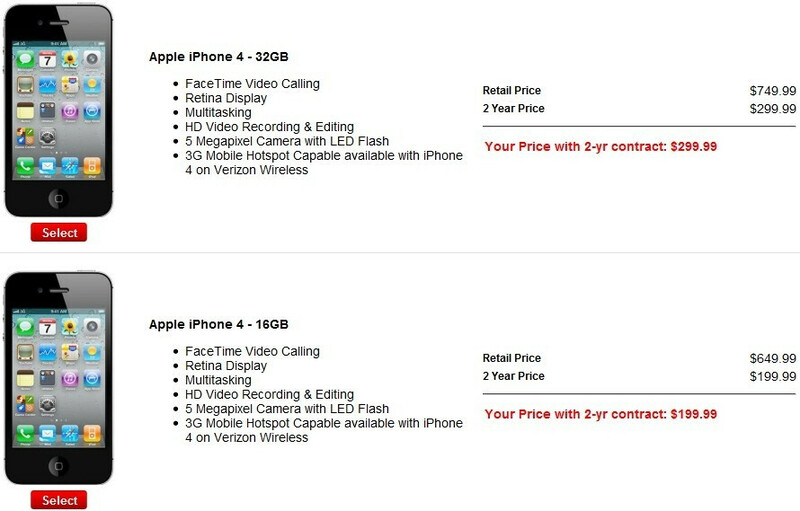 Now if your the type that has a fear of commitment, you can also buy the iPhone 4 without a contract for $649 (16GB) and $749 ($32GB). Additional add-ons is the monthly $30 3G data plan that is required, as wells as the optional equipment protection for $9.18 and $10.99 a month depending on the plan, Rhapsody music service for $9.99 a month, and 3G mobile hotspot with 2GB of usage for $20 a month. It also appears that VZ Navigator will be made avaliable for the iPhone 4 on Feb 10 (the official launch date) for $4.99 a month. 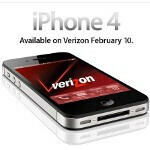 If you are interested in the Verizon iPhone 4, do you plan on pre-ordering it, or waiting until the official launch date next week to purchase it? I just checked the status of my order and it says it has been shipped!! Ordered the 32gb for me and the 16gb for my mum. Shame they make you get the unlimited data plan. She rarely uses more than 30mb a month. Maybe this will get her to use the phone more now lol. Was realy hoping for the mythical white iphone. Oh well. I can finally go to bed and not worry anymore! What we're you worried about lol? Perhaps I didn't phrase that correctly? LOL. Well she has the storm 2, and all she really uses it for is the email, rarely does she use the web on the phone. I had switched her to the 150mb plan to save money. I dont think shell use it enough to warrant having the unlimited data plan again, time will tell. Ordered mine. I was a little POed you couldn't charge them to your account. No 1 yr option??? Total FAIL!!! They expect me to be with this phone for 2 yrs when there is a newer model that might come out in June?? Gonna wait for the bionic or thunderbolt instead!! One-year options? Good luck finding that with Verizon or AT&T. Yeah that's just wrong. We have 1-year pricing on literally EVERY other phone in our store. If you want to point the finger, Apple would be a good place to start. I am having trouble ordering the phone im guessing system errors? Anybody no how they got their order to work? Had my alarm set to 2:50 got up an ordered mine. Cant wait til it gets here. I am so glad that the Iphone now has a reliable network, Verizon! That all depends where you are. Some areas Verizon isn't the most reliable. verizon is way more reliable than ATT. lol ATT is a joke!!! There is no way I would've stayed up or set my alarm for an outdated phone. If I we're with VZ I would've just waited for the Thunderbolt, ya know a phone that's 4G compatible and that I probably could get a 1 yr price on but to each his own. No one year contract price is an absolute JOKE! Apple now has VZ by the balls as well. That is a complete joke that they don't give you an option on the data or the 1 yr price point. Or the option to get employee discounts! neither does ATT for ANY apple products!!! Verizon no longer offers any other data plans for their smartphones other than the $30. So there would not be any options on the data. They did away with the $15 option, but that was just a promo anyways. And the new $10 data is only ment for non-smartphones. Needless to say : my 2010 Nokia N8 eats this iPOO for supper. When is Apple going to give hi spec features in their top end device ? you nokia has a camera.... thats it.